I expected more from TiVo chief exec Thomas S. Rogers, who recently answered a few questions from the Los Angeles Times at CES. Instead of vision, passion, direction, and confidence we’d expect from an innovator like TiVo, we got lukewarm, the obvious, and uninspiring. TiVo has been doing some interesting things lately, evolving from what it’s known for (time-shifted digital video recording) into a company offering a wide range (and still growing) list of “television services.” In the last year or so, TiVo’s signed deals with Comcast and DirecTV, Amazon (downloadable content), RealNetworks (music), Jaman (indie content), and has begun offering video podcasts, among other services. These partnerships are exciting and have helped TiVo survive, although its subscriber base dipped to 4.1 million from 4.5 million in 2006. Part of the reason for the decline is obvious: furious competition from cable TV, satellite, and teleco broadband operators, Internet-based solutions, Netflix, and compelling efforts from other hardware manufacturers like Apple, Sling Media, Microsoft (Media Player and Xbox), Vudu, and others. Despite the dip, TiVo’s stock has risen 27 percent to close at $6.90 on Friday, giving TiVo a market valuation of $683 million, the LAT said in its story, which ran Monday. Obviously, consumers beyond early adopters and home entertainment geeks are starting to catch on to the fight to win their living rooms. TiVo already has a brand name and has been in the living room for more than 10 years, while a company like Microsoft is more known for software than set-top boxes, even with the success of the Xbox game console. Cable, satellite, and telecom operators like Comcast, DirecTV, and Verizon FIOS offer warmed-over TiVo-like functionality in their DVRs, but they’re not TiVo. And what’s a Vudu? So when asked why consumers should choose TiVo, Rogers trotted out the usual PR bull — “ease and simplicity”, “intuitive”, “the need to get around and find what you want quickly and easily”, and “going forward that navigation and search capability is going to be absolutely critical to how people use their television sets,” Rogers said. Where’s the we’ve been innovating for more than 10 years and we’re going to continue to do so no matter what anybody else does. Here’s where we’re going. Or something to that effect. 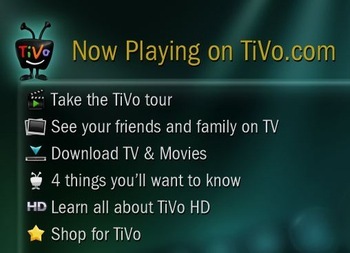 So where is TiVo going? “What we’re aiming to do is build a dream that going back 20 years ago people in cable and television have been talking about — being able to get anything you want, when you want to see it on your television set,” Rogers said. OK. We already know this. This is everybody’s goal. So what do these partnerships mean? Where can you take them? Do you need them to survive? What does it mean to offer “television services”? And so on. And: Why get Internet on your TV? “What we’re doing is expanding the universe of choice available,” Rogers says. But isn’t that what everybody is doing? Are we not living in an era choice? It’s a complicated endeavor to change the TV viewing experience. TiVo did it once with time-shifted TV viewing. But technology and the Internet are not standing still. TiVo must evolve to stay competitive. What is TiVo really doing? TiVo’s trying to stay in business long enough to develop a licensing revenue stream from its IP. All these new announcements about TV services are a total smokescreen, they apply to so few customers as to be entirely meaningless. They don’t apply to DirectTiVo customers, they don’t apply to new Comcast customers who have just begun to sign up for TiVo software on their Comcast DVRs, they don’t apply to older TiVo models that can’t connect to the Internet or newer models that don’t happen to be connected. They are all a PR smokescreen designed to divert attention from the fact that TiVo *still* has no sustainable business model. With their recent patent court wins they may still be able to develop one based on licensing their IP, but not if investors stop funding their ongoing losses before they can manage it. Bill – Sorry buddy, but you have it wrong. 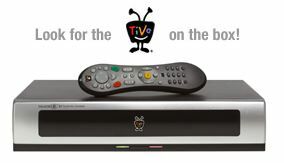 The Tivo offering are for stand-alone Tivo Boxes. 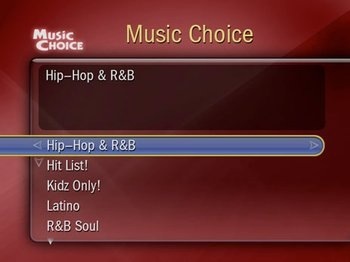 Both DirecTV and Comcast have a subset or basic Tivo functionality. I would guess that once cable customers have the Tivo Experience that they will want the full product. The older Tivo Series 1 is the only box not internet ready. Those boxes haven’t been sold new in years. Tivo reports that over 60% of new service contracts are connected to Tivo by the Internet. The business model is fine…..you forgot to mention that Tivo has gone International – Canada, Mexico and soon Australia will be selling Tivo boxes. DirecTV – their mistake, which they almost came out and said at the last Conference call – having to support NewsCorp family NDS . Sit back….Google, Yahoo, Amazon will scoop up Tivo as soon as the court case is settled – either way the verdict goes.